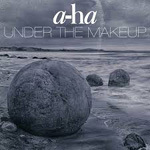 a-ha make a comeback with a new single "Under The Makeup", released as a download only single in Norway on 3 July 2015. The cover artwork features a large rock with small pieces breaking off the underside against a gold/brown background. a-ha is printed in grey letters at the top with the title in white underneath. A second cover artwork was released by Universal Germany following the identification that the previous one was too similar to the cover Italian singer Victor’s 2014 single "I'm a Renegade". The new cover features a grey-toned shot of some large rocks on a beach (another stock image) with the titles in white above. 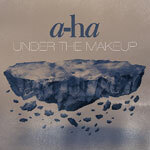 The download version of "Under The Makeup" differs from the mix on the album featuring some louder backing vocals and quieter orchestra.